A cluttered space is a cluttered mind, but physical space is not all we have to worry about. We live in a tech-savvy world where information is coming at us fast and with no end; add that to a mound of mess and disorganization and it’s a wonder we can still breathe. We have to clear our space entirely, not just the physical. Here are a few tricks to declutter quickly and efficiently. At some point our email accounts end up becoming junk mail central, you may even stop checking it just because you know you’ll have to go through pages of ads, deals, and newsletters before you get to that one important email. You could unsubscribe, but it doesn’t always work and it would take forever. Just shed it now. Create a new account and give the address to the ones you want to hear from, and let the email happy companies continue to send their deals into the abyss. Most of us have a time or two a year where we donate things we no longer want or need, but start doing this more regularly and everybody wins. Get a small box and a trash bag and go room to room collecting things that can go now rather than later: clothes, knick-knacks, accessories, kitchenware, etc. You may even ask to keep the box and use is as a monthly donation bin. Scary, I know, but you would be amazed at how much social media takes of your time and your sound mind. Scroll after scroll of politics, rants, and selfies is not natural. There are positives, and social media can be fun, but being bombarded by it seems to be the new normal. Deactivate for a bit, see if it helps, you can always go back or check in later. All those important papers, probably the most annoying clutter there is. Grab all the mounds of it dump it in the middle of the floor and separate what to keep and what is officially ready to be shredded. A good rule of thumb is three years old or more needs to go. If you have a shredder, great, if not put it in a bag and find your local shredder, most have a special rate for individuals and they recycle. As for what’s left, find a cabinet or box to organize it in, and get your counter and dinner table back. So what about those important, but not really that important papers? Like bank statements, student loan info, invoices etc. Go to your account online and go paperless. Start paying and reviewing all these things through the company’s portal and you will cut your paper clutter by more than half. This little hack is surprisingly satisfying. Grab your phone, go to contacts and remove the many people you never talk to or simply don’t even know anymore. You’ll notice there are quite a few and without them your cell phone and mind feel a lot lighter. If you want to make a tentative weekly to-do list, go for it, but make a daily one that morning and have a way to cross tasks off. Daily lists usually get done and if you do it the morning of, you’re a lot more honest about what you’ll be able to accomplish that day – and crossing things off, I swear, releases endorphins or something. What do you feel immediately declutters your mind and space? 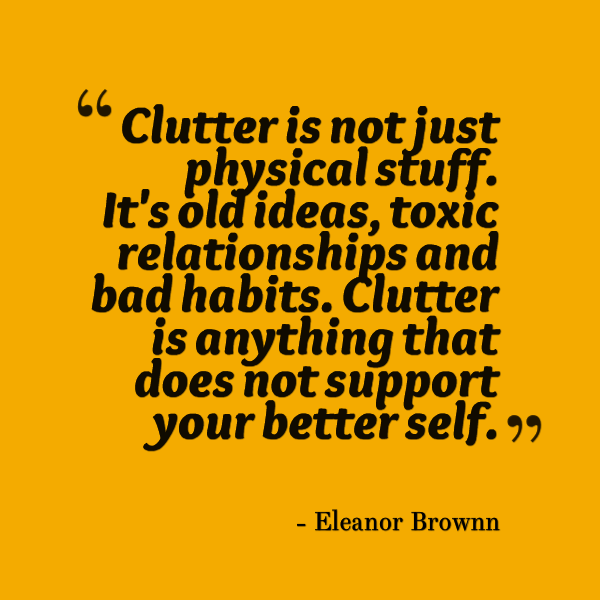 Read more "7 Ways to Declutter Your Life"